Before the mid–20th century, when air travel took over as the fastest mode of transporting people and our things around the globe, our ancestors primarily relied on ships for trade and transit. 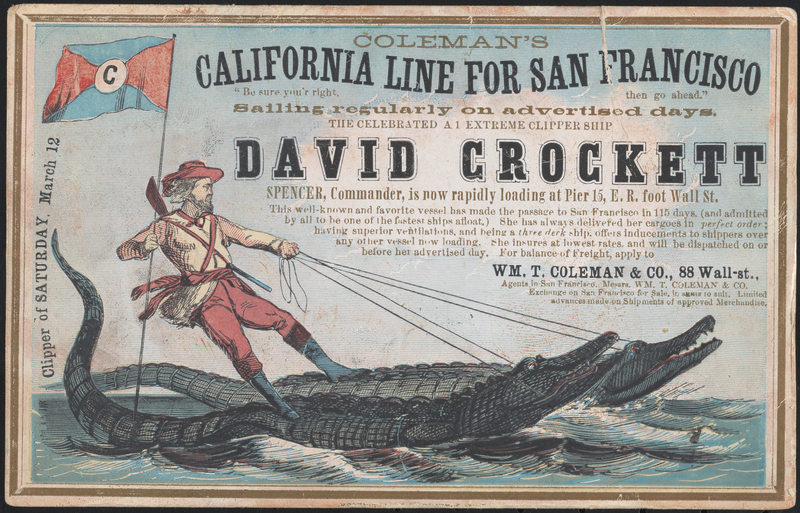 The 19th century became a pivotal time for the shipping industry as businesses invented economical ways to transport cargo and expand passenger travel, allowing mobility for customers of different income levels. 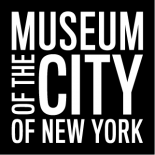 The Museum of the City of New York’s Collection on Ships and Shipping, part of our manuscripts and ephemera collection, contains material related to the port of New York produced throughout the 19th century. The items together reveal a remarkable timeline of innovation and achievements that transformed the port from a shipping hub into a gateway of international travel and trade. The first ships to travel in and out of New York, primarily via the East River, were brigs, schooners, and sloops. These small sailing ships were used domestically for mail and freight. They weren’t fast, but were quicker than shipping by land and served the purpose of getting goods where they needed to go. Documents such as the 1824 shipping receipt below were used by merchants to guarantee the safe arrival of goods. 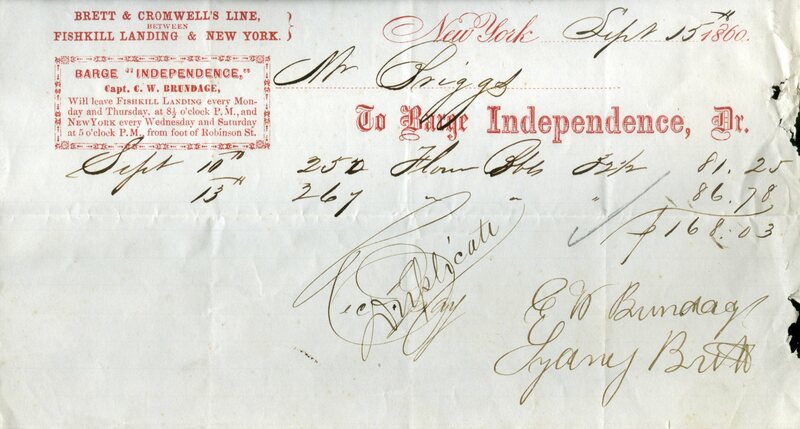 Later, as illustrated by the 1860 receipt of the barge Independence, shipping lines devised regular schedules. During the early 19th century, “Clippers” were considered the most time and cost efficient option for transporting cargo. These fast sailing ships were initially used for the growing tea trade between New York and China; by mid-century they gained popularity among New Yorkers heading to San Francisco hoping to cash in on the California gold rush. 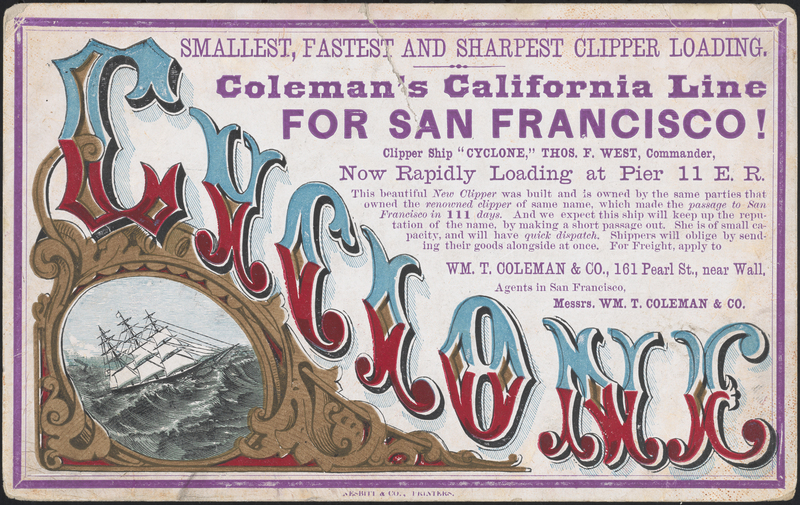 Companies advertised their services using cards known as “Sailing Cards.” As illustrated below, shipping merchants sought to promote their ships as the fastest in the business, boasting 111- or 115-day journeys to San Francisco. To compete in a crowded marketplace, businesses took to using stylized fonts to market their services to potential customers. They also displayed the operating merchant’s names – sometimes notable figures in the industry, including William T. Coleman and George D. Sutton. 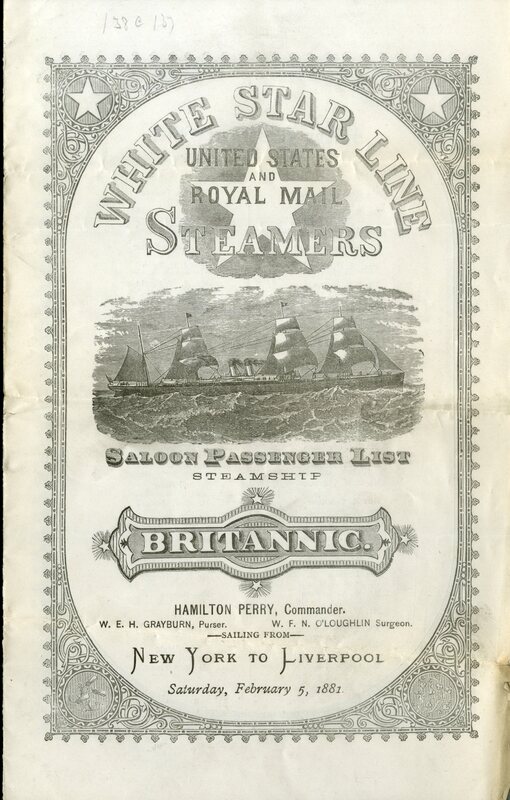 Steamships began frequenting the port of New York in the middle of the 19th century, and by the late 1800s, mail steamers had become the primary mode people used to cross the Atlantic. By incorporating a postal service, mail steamers wove passenger and cargo travel into a sustainable business model, which allowed mobility for the working class. 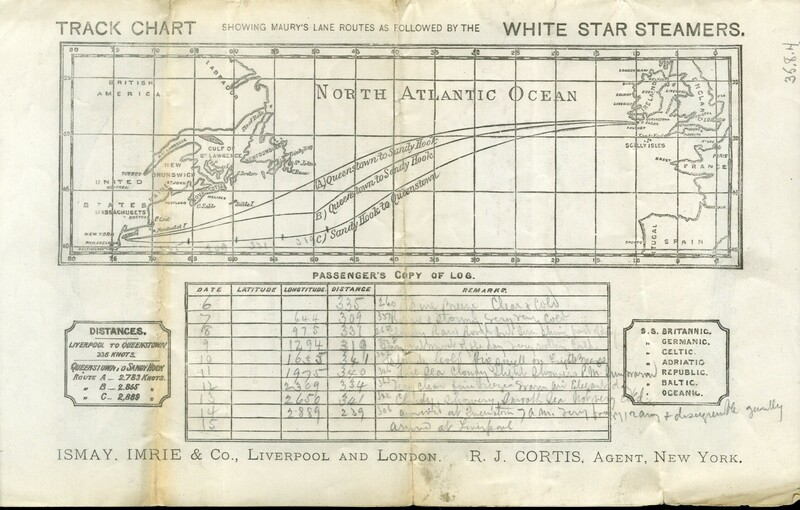 Trans-Atlantic travel ranged around seven days, providing passengers with set departure and arrival times at each location. New York City served as the primary state-side terminal for passengers making the journey. 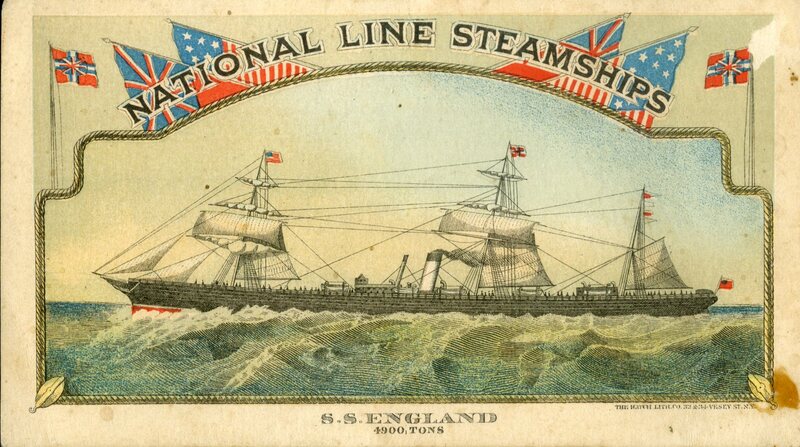 The below sailing card depicts the S.S England, one of the National Line’s 12 passenger steamships sailing in and out of the port of New York. The back of the card provides passengers with information about accommodations and passage rates. 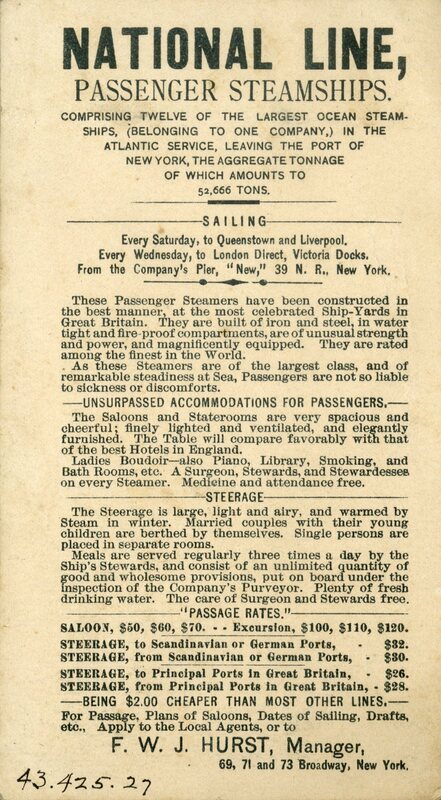 Passengers were informed of amenities that could be acquired on board, including interior cabin maps and passenger lists, prior to boarding. They also received social itineraries advertising the various activities during the trip. 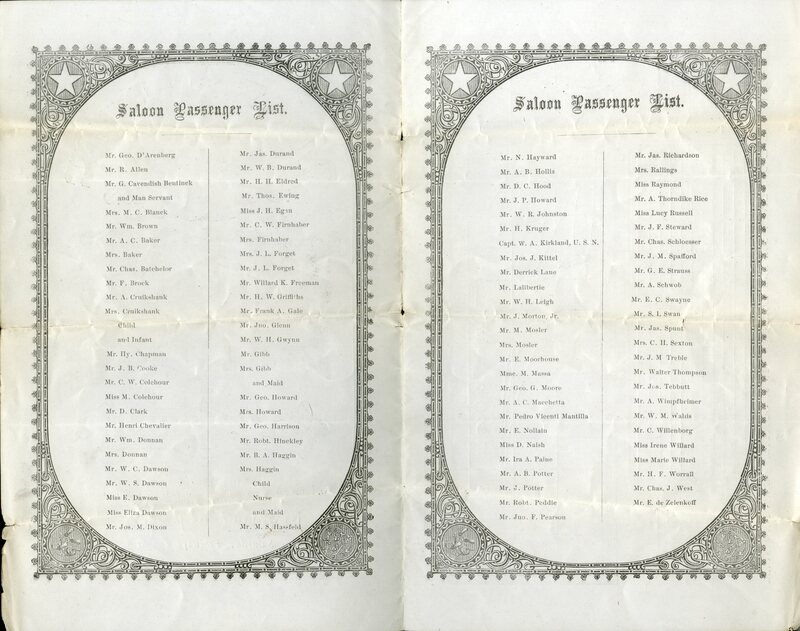 Pamphlets often included the company’s broad range of destinations and information on routes, which included route charts and passenger logs allowing travelers to keep track of their journeys as they sailed. Materials like these illustrate a shift in the shipping trade towards passenger travel from the prior focus on freight transport. The location of the city in relationship to the East and Hudson Rivers, and later the Erie Canal, were essential for establishing trade in New York’s formative years, and innovations like Clipper ships and steam travel opened the city and its residents up to international trade and travel. New York Harbor grew to be the nation’s busiest port during the 19th and early 20th centuries, helping to transform the city into the business and cultural hub we know today. The Museum is grateful to the National Endowment for the Humanities, whose support has allowed us to share the shipping material, along with several thousand other images from our ephemera collections. The remainder will be available by early 2017. Thanks to Collections Interns Trey Beddingfield for this week’s guest post. 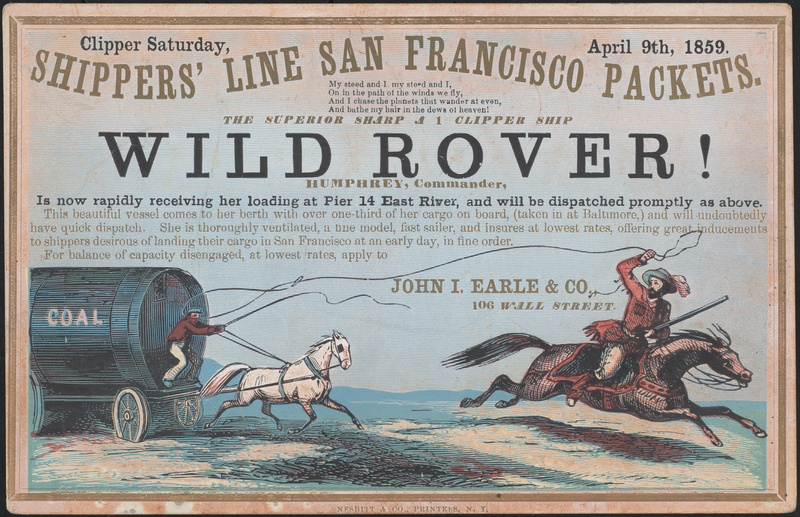 This entry was posted on June 28, 2016 by Emily Chapin in Manuscripts and Ephemera and tagged 1800s, 19th century, Advertising, Ephemera, Harbors, National Endowment for the Humanities, New York City, Ports, Sea travel, Shipping, Ships, travel.